The days of waiting in long lines with a restless child are over! Families need to schedule an appointment to visit Santa. The sessions are approximately 3-5 minutes. After your session please allow time to view and order your images. Packages are printed on site and ready to take home at check out. Appointments are per family – not per child. Each family needs to book their own separate appointment. We can accommodate family groups as long as the individual families have booked appointments in connecting time slot. Appointments are scheduled in 5 minute slots so book early to get connecting time slots. When you arrive at Photos with Santa by Jordan Photography please check in with our staff. To schedule an appointment or check availability, please visit our SCHEDULE page. Then, select the appointment option that best fits your family’s needs. Choose the day and time that works best for your schedule. Finally, don’t forget to click on the Confirm Appointment button to finalize your appointment slot or the session will not be booked. This is a private one-on-one experience with Santa. During your visit, a photographer will capture your children’s reactions and real emotions to seeing and interacting with Santa. Sometimes parents need to be in the photo to get a child to relax so be prepared and dress accordingly. If your child is very afraid of Santa and wants nothing to do with him, check out the Peek A Boo Santa Option. This is a 3-5 minute portrait session. A credit card is required at scheduling. Late cancellations or no-shows are subject to a $25 cancellation fee. This optional experience is for children that might be afraid of Santa. If you know in advance that your child wants nothing to do with Santa, you can try this option. It is best to try this option before your child has seen Santa. Santa will be hidden when the child enters the portrait area. One way in pulling this off is to explain to your child that Santa is checking on his reindeer and that you want a portrait of them by themselves, with their siblings or with you. We set up the shot by keeping the child’s attention on the photographer. At the right moment; Santa will appear to place himself in the photo without the child knowing. Sometimes parents need to be in the photo to get a child to relax so be prepared and dress accordingly. We will spend a reasonable amount of time working with nervous children. Pictures will be made with Santa behind the subject(s) and if possible on Santa’s lap. This is a 3-5 minute portrait session. A credit card is required at scheduling. Late cancellations or no-shows are subject to a $25 cancellation fee. Jordan Photography is proud to present a sensory-friendly optional experience for children with special needs and their families to enjoy a photo session with Santa. Parents are encouraged to visit Santa earlier in the season and call in advance to create the most comfortable environment. 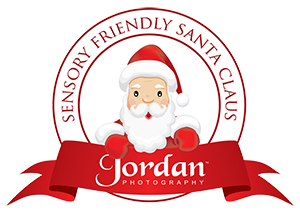 When arriving at Photos with Santa, please let one of the Jordan Photography staff members know you have a sensory-friendly appointment. Extra care has been taken to support the sensory, physical and other developmental needs of children so they can enjoy this wonderful holiday tradition. This is a 3-5 minute portrait session. A credit card is required at scheduling. Late cancellations or no-shows are subject to a $25 cancellation fee. Pets with Santa Sessions are available weekdays only from Nov. 19th through Dec. 14th. All pets are welcome but must be secured on a leash, in a carrier or held by the owner at all times. Appointments are required and allow us to prepare in advance for your pet session. This is a 3-5 minute portrait session. When you arrive, please meet our staff at the door and let them know you have a pet. We request that your pet wait outside until their turn. For everyone’s safety, please do not bring your pet if they have a history of biting or aggression with people or other animals. A credit card is required at scheduling. Late cancellations or no-shows are subject to a $25 cancellation fee.